Ignition of a match. Image credit: MatthiasKabel via Wikipedia. The earliest matches were unsafe to manufacture and almost as dangerous to light. In 1805 a French chemist invented a self-igniting, chemical match that was a piece of wood that was treated with a mixture of potassium chlorate, sulfur, sugar, and rubber. To light this match the user had to dip the matchstick into a bottle filled with sulfuric acid. The chemical reaction would produce a flame…and also a highly flammable gas called chlorine dioxide. These matches were replaced by friction matches nicknamed lucifers because they were prone to explosions and foul odors. Then in 1830 another French chemist named Charles Sauria discovered that when white phosphorus (called yellow phosphorus at the time) was added to the head of a matchstick matches could be lit anywhere. These new “strike anywhere” matches were in great demand and very profitable for manufacturers. But this innovation came during the Industrial Revolution before employers were compelled to implement safe working conditions. So low wage employees were required to work long hours over heated vats that emitted toxic fumes that proved to be destructive to bone tissue. Doctors soon treated these laborers for a disease that caused their jaw bones to rot and decay. The disease became known as “phossy jaw,” osteonecrosis of the jaw, or biophosphate induced osteonecrosis of the jaw (BIONJ). Subsequent research revealed that only laborers who handled white phosphorous during match production were the people who developed the disease, not those who worked in the office. When inhaled the fumes from the white phosphorus interfered with bone remodeling causing “phossy jaw” to develop. 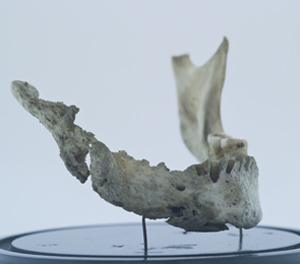 Mandible showing damage caused by “phossy jaw” at the Hunterian Museum. Bone is remodeled, or renewed, throughout life by cells called osteoblasts and osteoclasts. Osteoblasts secrete new bone tissue while osteoclasts break down old bone tissue and resorb it. When 19th century matchstick factory workers inhaled white phosphorus vapors the phosphorus circulated throughout the body and combined with other chemicals to produce bisphosphonates. The bisphosphonates poisoned the osteoclasts, which greatly reduced or eliminated the remodeling of old bone. Because the alveolar bone around the teeth and in the jaws turns over more rapidly than in other parts of the body this region is more sensitive to bisphosphonate toxicity. The beginning symptoms of osteonecrosis of the jaw include toothaches, swollen gums, loose teeth, and an abscess around the infection. Teeth fall out, the bone under the nonhealing gum tissue becomes exposed, and the affected bones glow in the dark. Eventually the decaying tissue rots away causing a foul odor. Amputation used to be the only treatment. The London match girl strike of 1888 attracted attention to this occupational disease, and prompted the opening of a match factory that used red phosphorous, which was considered safer. Despite the fact that the cause of BIONJ was identified as early as 1844, legislation that prohibited the use of white phosphorus in British match factories was not enacted until 1910. The elimination of white phosphorus in British match factories eventually eliminated the disease in England. In 1913, the U.S. chose to place a ”punitive tax” on white phosphorus-based matches that was so high it made manufacturing them unrealistic. “Phossy jaw” was thought to be almost eradicated until a second outbreak was identified in 2003. Oral and maxillofacial surgeons recognized BIONJ as a horrifying side effect of medications containing bisphosphonate used to treat metastatic cancer and osteoporosis. Today osteonecrosis of the jaw is treated with microbial mouth rinses, antibiotics, and removal of the necrotic bone.